Debussy merges into Ravel’s leap over 32 years to unite their souls, turning the former’s sparkling keyboard explorations into a vibrant, shimmering orchestral work titled, ultimately, simply Danse. Need more be said? A fourth and much celebrated Frenchmen created the concerto in this program. It is Camille Saint-Saëns’ Violin Concerto No. 3, written a few years after Ravel was born. Evidently now considered the best of his such works, it contains drama, a sense of gentle song and a fiery finale. 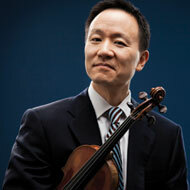 David Kim, concertmaster of the Philadelphia Orchestra, is the soloist. Also in the concert comes the first symphony from Russian astonisher Dmitri Shostakovich. He created it when he was 20 and had not yet made his indelible mark. “Wry”, “Antic”, “Martial”, “Impressive” are words which program annotator Paul Schiavo uses to describe its elements.